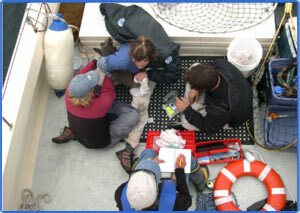 Scientists on a tagging cruise at Cordell Bank. Michelle, Sue, Michael and Carol help attach a 54 gram satellite tag to a Black-footed Albatross and record measurements to determine gender and age-class. Photo by Tanner Nevill 2004. 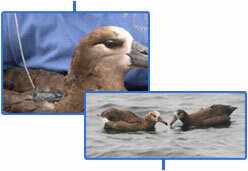 Like many marine animals, the Black-footed Albatross are affected by human activities. Many issues that affect the Albatross similarly impact other marine animals such as sea turtles, whales, seals, and dolphins. Plastic pollution has become increasingly common sight in the world’s oceans. Marine birds, mammals, turtles, and fish can become entangled in plastic rings or drifting fishing gear thousands of miles from shore. Surface-feeding birds such as storm-petrels, albatrosses, and shearwaters are prone to eating plastic fragments because this material breaks up into tiny particles that look much like their natural foods. Plastics are not the only problem for Albatross, however. In recent years, scientists and conservationists have become concerned about the albatross because, like marine turtles, they are often hooked accidentally on long-lines, a fishing method used by many nations. To help the birds, scientists need to learn about where birds of different ages and gender spend their time after leaving breeding colonies in Hawaii and Japan. With funding from National Fish and Wildlife Foundation and Cordell Bank National Marine Sanctuary, a group of scientists from Duke University, Moss Landing Marine Laboratories, The Claremont Colleges, and Oikonos Ecosystem Knowledge are tracking birds that visit Cordell Bank, off Point Reyes, California, from July to September to learn more about this important species. Many Albatrosses die in U.S. and foreign commercial long-line fisheries because they are attracted to the large amount of bait attached to thousands of hooks on a long-line. Managers and fishers have worked to develop techniques that reduce the number of birds caught on hooks, and continued efforts are needed to apply these and other methods effectively. 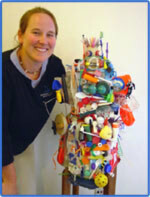 Jennifer Stock, Cordell Bank National Marine Sanctuary education specialist, poses with "Trash Monster" by Artist Keary Sorenson. Inspired by artwork focusing on plastics in the ocean at OceanFest 2003, at Crissy Field, Keary has collected beach debris from Fort Ross to Rodeo Beach in the Marin Headlands, California to create this sculpture. Similar debris is often found in the stomachs of dead albatross chicks. Trash Monster is on display at the Red Barn Classroom with Cordell Bank National Marine Sanctuary art exhibit till end of October 2004. In 2004, our first results reveal that some albatross tagged off California have flown as far as Alaska and Japan. Based on the data, we are investigating the importance of wind patterns for these far ranging individuals. Signals of Spring students will investigate albatross movements in relation to water depth, gradients of temperature and chlorophyll, and dynamics of wind in the North Pacific Ocean. By using telemetry and remote sensing data, students will investigate the migratory behavior of the Black-footed Albatross, learn why Cordell Bank is an important destination for this migratory species, and analyze how ocean systems and human activities (e.g., plastics, different fishing practices) affect these endangered birds. In addition to plastics and long-line fishing, humans affect the birds in other ways. On islands, where seabirds mate, rear young, molt, and rest, populations are affected by the introduction of cats, rats and pigs which will eat both eggs and young and degrade habitat. The introduction of non-native, invasive plant species can easily change the birds’ nesting habitat and even prevent albatross from nesting, as has happened on some Hawaiian Islands. A major challenge for marine conservation is working with so many different nations to protect them. The reality is that migratory animals do not recognize political boundaries, and therefore it is hard for a single nation, like the United States alone, to protect these species. Tracking movements and evaluating important habitats are important first steps toward assessing and encouraging international responsibility for albatross conservation.